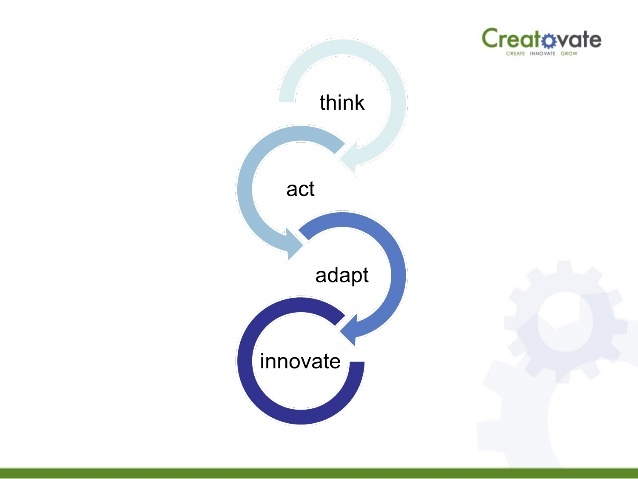 Think, Act, Adapt and Innovate like a Startup! Large companies’ size and culture make disruptive innovation extremely difficult (Blank, 2010). Despite this challenge many large food businesses today recognise the need to be disruptive innovators and test new business models in the digital world. Change is coming, it’s here now and there are many ways businesses can react to change. They can duck and hide and hope the flying baseball bat misses them and takes out the competition. 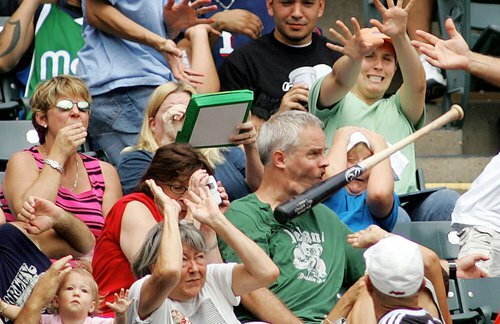 They can look the other way and collect the full force of change to the face like the poor gentleman below at the Red Sox game or they can be brave anticipate the changes that are coming and reach out for the bat like the guy just out of shot. Often its the startup that is just out of shot or sight of the incumbents. Backed by passionate founders and astute investors they anticipate change, react to it positively and use innovative new business models and new technologies to literally land the baseball bat in the face of the incumbents and harvest the glory of fast growth in a new economy. In this keynote address given at Food&Drink Business Live! Disruptive Innovation, Creatovate – Managing Director, Dermott Dowling takes the audience through some practical learning steps and lessons from local digitally focused food innovators leading the way in this exciting new land of opportunity. Thinking is the first step in any business innovation. Alas, it’s hard in isolation. 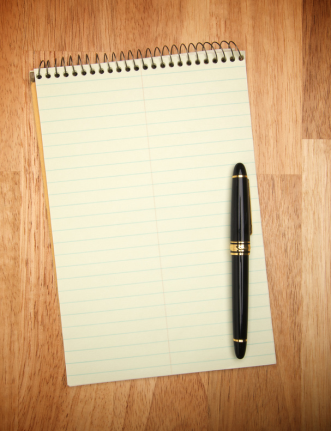 You sit and stare and scribble on the blank sheet of paper in front of you. However, people as social beings need each other and our collective mind power to come up with breakthrough ideas to innovate. More often than not we scan the environment for what’s out there already and working? Alternatively, we look for problems – what’s bugging our current customers or potential new customers? We then map the value chain from inputs to outputs looking for – what can we take out? Where can we fit in? How we can create value for customers and ultimately our own business? Next step in the process of building an exciting startup or disruptive innovation is design & rapid prototyping our ideas into Minimal Viable Prototypes or MVPs. Rough and ready is fine here, what’s most important is we start testing & experimenting our hypotheses on existing and new customers ASAP. Gone are the days we spend weeks and months in kitchens, pilot plants and focus groups with consumers. The market demands we move at ‘tech speed’ now! I can not wait as your customer or your boss for months while you toil and spend $$$ without any real customer or consumer feedback! By that I mean people reaching into their pockets and paying for the food and beverage products, not just talking about how cool it is or whether they might like to buy it when it hits the shelf in 12-18 months time! As we act, we simultaneously align as a team adapt to the changing customer feedback. We also measure & monitor early results for signs of customer acceptance and readiness to scale our new business model. Startups are not small versions of large companies. They need different tools for thinking and acting. Its important you create a common language in your company if you venture down the path of creating intrapreneurial startups inside your large organisation, so people are talking on the same page and not hearing Blah! Blah! Blah! when we mention new terms like Business Models. 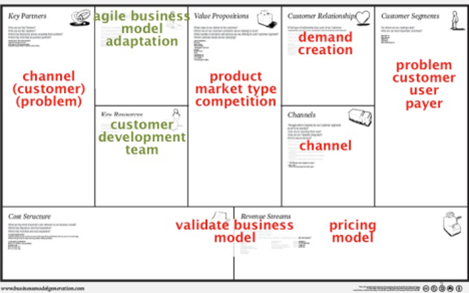 For this reason at Creatovate, we recommend a common approach to our clients hypotheses generation like the Business Model Canvas (Osterwalder, 2012). 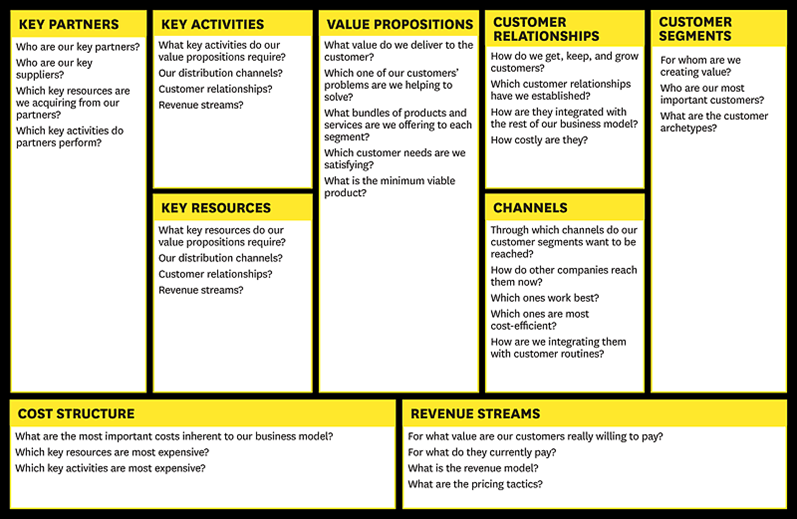 This is an excellent thinking tool to get the team ‘on the same page’ in terms of understanding of terms, hypothesising ideas and creating a new Business Model for real market testing. 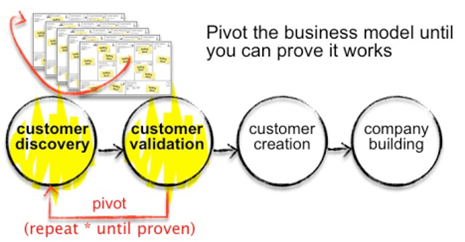 Once you have thought and aligned on your initial business model hypotheses “get out of the building” and ask potential users, purchasers, and partners for feedback on all elements of the new business model, including product features, pricing, distribution channels, and affordable customer acquisition strategies. If we accept that startups are engaged in the search for a new business model, we recognize that radical shifts in a startup’s business model are the norm, rather than the exception. For this reason rather than fire the executive team when the normal approaches to go-to-market are not working, we pivot and change tack (Blank, 2013). Pivots are a completely normal part of the startup process as you first discover customers who will pay an acceptable price for your product and validate your minimal viable prototypes fit their needs and are worthy of scaling. Venture Capital and astute investors understand pivots as an essential part of building a startup. The question is does established incumbent business leaders understand they need to treat startups in their own company very differently to the normal go to market new product development that may go through an existing business process like Stage-Gate to existing customers using existing norms. If you are going to create a breakthrough innovation and business model in the digital economy its highly likely you will be doing things very differently. As such leaders need to be aware of a different set of behaviours and skills to encourage the startup founders and intrapreneurs to boldly push on and not be afraid to pivot as they learn and lean left and right to find the right business model and validate their multiple hypotheses. 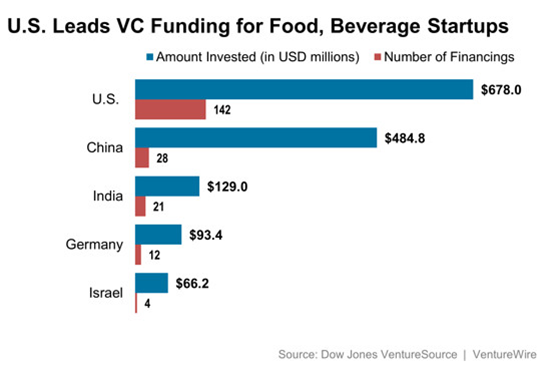 Private equity and venture capital are investing in disruptive startups in the food industry right around the world. The top 25 U.S. food and beverage companies have lost an equivalent of $18 billion in market share since 2009. Some analysts are describing ‘big businesses in food’ nowadays as being like melting icebergs, every year they become a little less relevant to customers and consumers (Kowitt, 2015). Major packaged-food companies lost $4 billion in market share last year alone, much of it to smaller, more health-conscious companies. Venture capital firms are taking notice. Over the past five years, they have invested nearly $570 million in food companies. Famous Australian VC/PE funded food businesses include Rafferty’s Garden (Anacacia Capital’s sale of baby food maker Rafferty’s Garden to PZ Cussons for over A$80m). Notable trade sales recently of established food businesses that have been reinvented include Pacific Equity Partners’ sale of Peters Ice Cream to UK-based ice cream maker R&R (AVCAL Handbook, 2014). Large multinational food companies are not taking the changes in their markets lying down. Nestle founded Inventages in 2002 and has invested EUR$150m in 38 companies across a breadth of categories from consumer health sciences to CRM to supply chain to innovative packaging solutions. Tate & Lyle established Tate & Lyle Ventures in 2006 initially with a £25M VC fund & currently has another active £30 million fund investing £1-2 million per tranche in each investment. 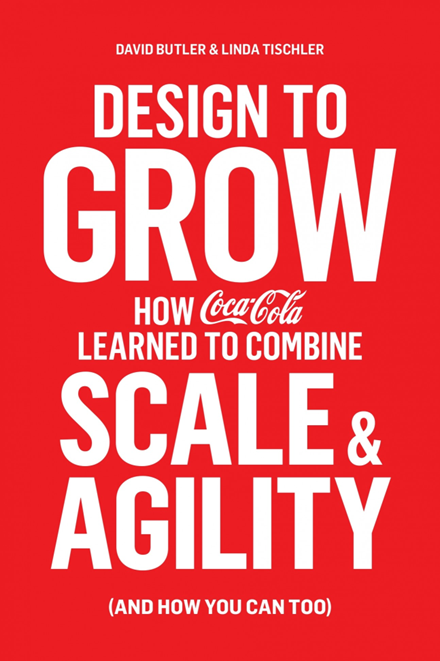 Coca-Cola Founders program was established in 2011 and already has 19 co-founders, across 10 countries, with 9 startups partnering with Coca Cola to provide much needed scalability to the startups and their co-founders. Large businesses need startups and vice versa. Is there some magic in the middle and what can incumbents do to learn to be lean and act and adapt and innovate like a startup! Established businesses are in danger of not being able to adapt quickly enough, while nimble start-ups fail due to their inability to scale. Tomorrow’s business winners will be the ones who know how to combine the two (David Butler, VP Innovation & Entrepreneurship, Coca-Cola). 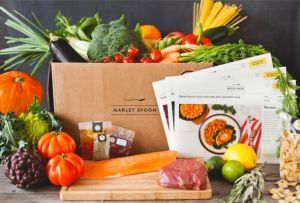 Australia is seeing signs of life now in the land of digital disruption with several new startups from both existing food companies and new entrants. Some digital disruption innovation leaders interviewed for this key note include Dish’d Kogan Pantry and Marley Spoon MDs & Founders. Each business plays to its own unique space in this exciting new field of play, but there are several key common learning shared by their leaders for any business thinking about entering the exciting and highly disruptive digital innovation landscape in food. Sub-culture of a startup within a large business can be hard to swallow for staff and senior leaders alike in established traditional food businesses. Patience is essential alongside persistence with payback horizons very long and initial sales may fall well short of what can be expected from taking NPD to market through traditional go to market retail channels. 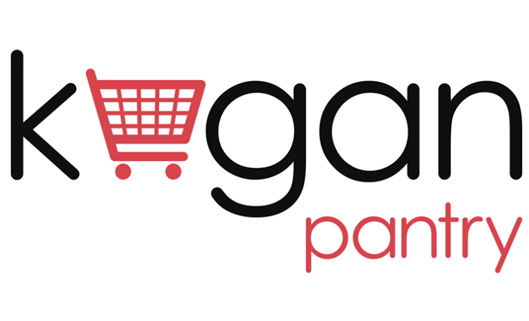 Consumers want whole of shop/meal solutions rather than parts of the pantry stocked from several different eTailers, and they are looking for suppliers to make their lives easier, not harder when it comes to shopping online and/or cooking meals at home. Inventory / demand / supply chain management is even more challenging in the online with demand for hot specials either going viral and off the charts or product being unappealing and not moving at all. Never underestimate the response from incumbents who will fight back extremely hard with loss leading specials and pressure exerted on their existing suppliers to restrict supply of goods and inputs to the new entrants. Go in eyes wide open – the online world requires the same effort if not more than a business in the bricks and mortar world of food and beverage manufacture, supply, distribution and marketing. We get asked this question a lot from our clients! Our first response, is to remember that whatever innovation or change you make it must create economic value to you and your business. Change for changes sake is not innovation, it might be creative but its not innovation until it delivers economic return to your business. This may not happen for significant time when testing new business models or startup strategy but we also ask our clients what are the possible consequences of doing nothing? Going backwards? 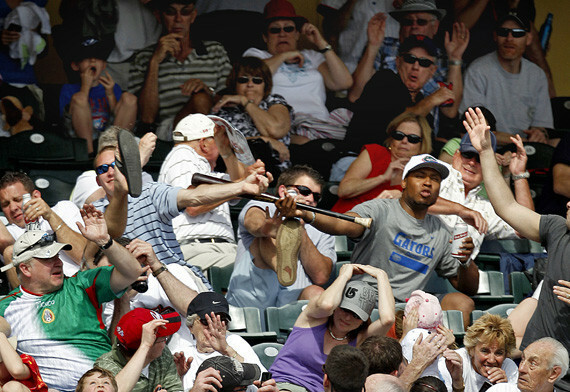 Getting hit in the face by a baseball bat? You may be chasing additional demand and/or contributing back to your online community if you are already an established online entity. You might be looking to engage and interact with existing and new consumers if you currently exist in the traditional bricks and mortal retail led food industry. You may be seeking to grow into adjacent verticals. Whatever your strategic reasons, for action they need to be strong enough to survive the bumps in the road ahead as there will be many! Some of the key advantages from entering the online world of food and beverage eTailing are the longer term potential scale advantage that can come quickly if you are successful. Likewise the plethora of instantaneous data analytics like Google Analytics that can help you pivot and test and adapt much more quickly than through traditional customer/retailer feedback networks. Recognise that Australian eCommerce market maturity could be as much as 5 to 10 years behind the US and our Australian eCommerce supply chain maturity has some considerable road to run especially in the area of chilled B2C food or meals solutions delivery to consumers doorsteps. These are significant challenges and can not be underestimated but the early entrants will learn faster and be further down the field as new enabling technologies like drone deliveries or driverless vehicles become very real solutions to today’s very high cost of service to the Australian consumers doorstep. Omni-channel could be a red herring – beware! The economics are vastly different between off-line and online retail in Australia, however for incumbent off-line retailers who have online eTail offers the commercial incentives are quite simply not there to lower their online prices for their eTail offers such that it would cannibalise their healthy real world margins in bricks n mortar retail. Let us not forget the significant sunk costs the incumbents have in ‘land banked’ property investments, the enormous number of staff on their books in their shops who would cost $$$ to layoff if their online services took off! Food manufacturers, wholesalers and suppliers are aware of the current industry trends and have a strong willingness to supply new food focused digital startups. That being said beware the earlier caution about incumbent retailers pressure to stop supply to new entrants. Price leadership is of paramount importance online and that could be in part due to the fact that Australian consumers have been trained to expect deals online. 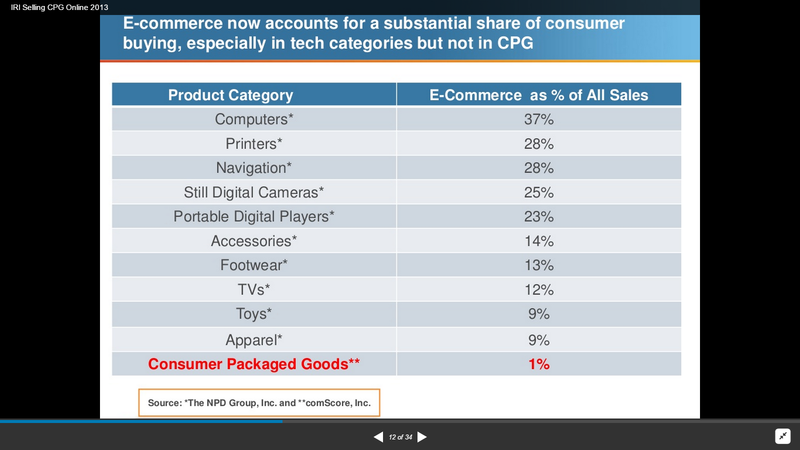 Brands matter online and deep cut discounts bring traffic! Groceries look like the last to take-off in the land of digital commerce. Online suits small, expensive, commodity driven categories hence why it has disrupted so intensely in travel, music and electrical goods. Wastage is an important driver in eCommerce in food. Consumers care about their household (average 20%) and supermarket waste (average 35%). This can be a compelling emotive and commercial value proposition for digital disruptors. Consumers also expect their food in the same condition they find it in store when they get home and see it at their doorstep. Clearly, we have a long way to go in terms of digital disruption and disruptive innovation in the food industry in Australia and what is around the corner is the million dollar question for startups and incumbents alike. When an intelligent member of the audience from Nestle Australia asked “what’s the next big thing in terms of disruptive innovation in the food industry in Australia?” to the panel of experts on the stage she got 6 very different answers ranging from predictions of drone and driverless vehicle meals and drinks delivery to consumers demanding a direct interaction with their favourite food producers not only in the social media landscape but in terms of direct purchase and order-to-delivery-to-doorstep. One thing is certain, the businesses that can have the foresight to anticipate change and react positively to it will be the ones who avoid the baseball bat to the face and will seize the opportunity our new tomorrow brings to us all. The multi-million dollar business question is which of the incumbents or venture backed startups has both a) the foresight and b) the resilience and bravery to not only see the bat coming but to calmly stand up, reach out and catch it! When everyone breathes the collective sigh of relief and the startup sits back down in the stands, they will have banked the profits on the table and will be the new incumbent. Go Gators! Kowitt, B (2015) Special Report: The War on Big Food Fortune May 21. Osterwalder, A. Pigneur, Y. Bernarda, G. Smith, A. (2014) Value Proposition Design Wiley. 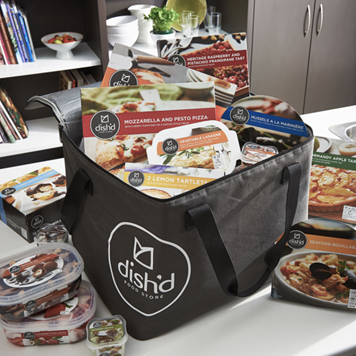 Phillips, E. (2015) Food ‘Accelerators’ and the $10 Bag of Pasta The Wall Street Journal Jan 6. Kolodny, L (2014) Will Investors Still Back Food Startups As Competition Heats Up? Wall Street Journal July 25. Is your Innovation disciplined or are you simply dreaming up new ideas?